Tropical Mango Parfait & Fun Mail! Happy Hump Day all! It was pretty hard to get up at 5 AM today, but, once I got up and working out I was energized and ready to go! I woke up and did an intense Circuit Strength Training session followed up with an ab burning CORE routine. I lit my Mandarin Aroma Oils and put on my calming seas CD to do meditation and Yoga. Meditation today was focused on today’s theme “Compassion” ~ Compassion towards others and compassion towards yourself. With each breath in you breathed in all the negative thoughts and as you exhaled, you cleansed your mind/body of these negative things. It was a pretty empowering exercise and I found my breaths matching up with the waves in the ocean. Yesterday I was asked to tell you all the Yoga Sun Salutations series that I do in the book. It’s a simple series for beginner yoga people and they have intermediate/advanced levels in the book. I sort of add a little to it too. You do each of these 5 deep Ujjayi (deep) Breaths in/out. I go through the series twice – once for each side and focus on form over speed. If you are interested in trying out some online yoga classes or want to see pictures of how to do these poses, I highly recommend YOGADOWNLOAD.COM. They have a bunch of FREE 20 minute sessions you can download onto your computer or ipod along with the step by step printouts. I LOVE them and do them often! 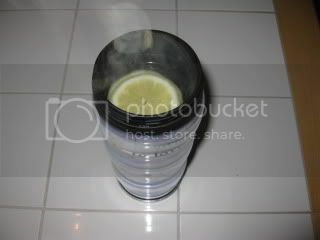 I started off my day with my Morning Burst Lemon Water at home and togo 😀 LOVE this stuff! 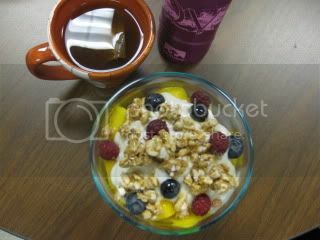 Breakfast today was perfect for the spa experience ~ A Mango Tropical Parfait! Today is ALL about tropical fruits so you will for sure be seeing a lot of them – yeah! I honestly felt like I was having DESSERT for breakfast ~ who doesn’t LOVE that!!! All of that goodness 3 Weight Watcher Points – yum, yum! On the side, I had a cup of Celestial Seasonings Decaf Sweet Coconut Chai Tea from my Tea Bag Swap. I LOVED this flavor – it’s really coconutty with a hint of chai spices. I bet it would be great sweetened with a little agave nectar. So far, I am still not missing coffee either ~ yeah! Yesterday was a good day – I seemed to be starving ALL day but I managed my hunger well, listening to my body and picking healthy snacks when needed. I didn’t have time to do my spa treatment so tonight I am making up for ALL 3 days with a spa night ~ recipes to be posted in the AM for that! I forgot to tell you all about the FUN MAIL that I received yesterday. I have really wanted to try out Mr. Krispers ever since I first heard about them. All of their products are made with 100% natural ingredients, contain 10-11 g Whole Grains Per Serving, are baked, never fried, Certified Gluten Free and you can recognize ALL the ingredients on their package!!! And let’s be honest here, who doesn’t LOVE Rice Chips?! Crunchy, snappy and addictive. I am always on the look out for a healthy alternative to my fat laden regular chips. Seriously, who wouldn’t want to try out a crunchy, salty, 110-120 calorie snack that you get 35-37 chips per serving for ONLY 2 Weight Watcher Points!!!! They have 6 flavors available and two of them are VEGAN!!! Review, reviews and MORE reviews coming in 12 days (post Bikini Bootcamp Reward #3!!!) 😀 But, since I know I cannot tease you all by flashing all the goods and not sharing. 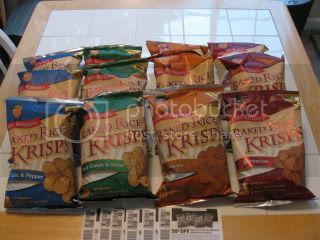 Be sure to check back tonight as I will be announcing a Mr. Krispers Bake Rice Krisps Giveaway!!!! Guess what though ~ I will be announcing another fun Bikini Bootcamp Challenge Giveaway up next!!! And, not that I am promoting making a late night run for a root beer float, but, if you live near Sonic they are kicking off summer today by giving away FREE Root Beer Floats from 8 pm – Midnight. Click HERE for details and be sure to have 1 or 2 for me!!! 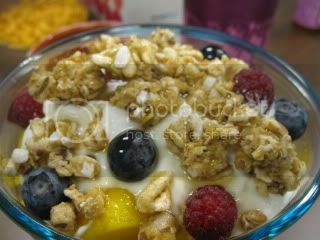 Your parfait is divine! Hooray for feeling skinnier in your pants…me too! It's completely motivating. dang no free root beer floats for me! that could be bad! hooray to the looser pants 😀 with all those steps and calories burned no wonder! you are rockin it D! i looove the honey almond flax crunch business! it is the closest i come to the TJ's 9 grain cereal! looks like you are at one with your inner peace.. keep up the good work! I just LOVE yogadownloads. I am obsessed with that site! I seriously have downloaded HOURS of yoga practice. SO fun! What kind of mat do you use? Dessert for breakfast is always a great way to start the day! Can't wait for your Mr. Krisper reviews!! Angelea ~ That was seriously my favorite parfait so far I think and I am not even a big mango person. Those krisps look great! I'd want to try the Sun-Dried Tomato Basil. Yum! Oh wow! I am so jealous! I love the salt and pepper variety, but I have a hard time finding any of the other flavors. Let me know what you think of them! Anne ~ I am not a fan of mango, but, in this parfait it was amazing. I'd eat it all over again. Chickpea ~ I can't wait to try them all especially since I've never seen them in stores around me.